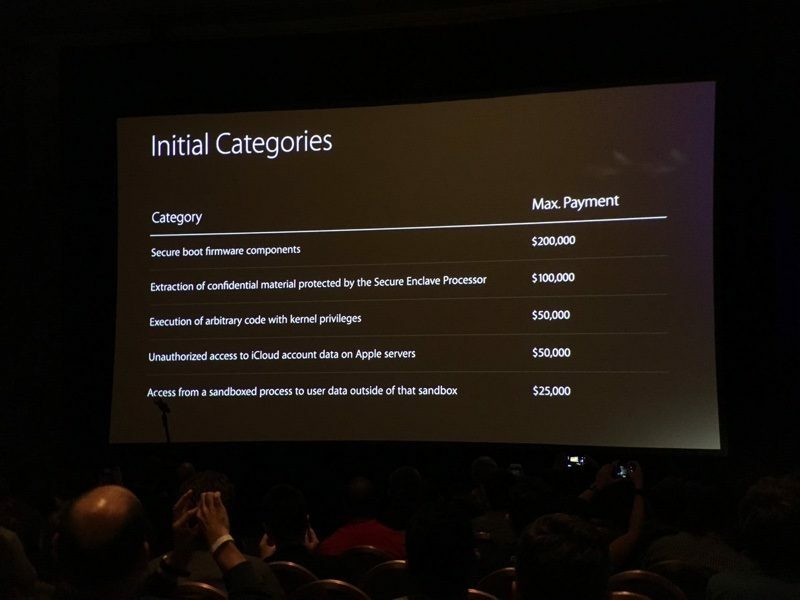 At today's Black Hat Conference, an annual event designed for the global InfoSec community, Apple's head of security engineering Ivan Krstic announced the launch of a bug bounty program that will see Apple paying money to individuals who discover major bugs and security flaws in the company's software. Many major technology companies like Google and Microsoft offer bug bounty programs to encourage people to discover and report major vulnerabilities, but until now, Apple has declined to provide a similar program. According to TechCrunch, Apple's new bug bounty program is part of Apple's effort to open up to hackers, researchers, and cryptographers who want to help improve the company's security. Apple will be offering bounties of up to $200,000 to researchers depending on the vulnerability that's discovered. Secure boot firmware components will earn $200,000 at the high end, while smaller vulnerabilities, like access from a sandboxed process to user data outside of the sandbox, will earn $25,000. Although each category of vulnerability maxes out at the given rate, Apple will determine the exact reward amount based on several factors: the clarity of the vulnerability report; the novelty of the problem and the likelihood of user exposure; and the degree of user interaction necessary to exploit the vulnerability. Apple plans to launch its new bug bounty program in September. To be eligible for a reward as part of the program, researchers will need to provide proof-of-concept on the latest versions of iOS and the company's newest hardware. Apple will also encourage researchers to donate their earnings to charity and will match all bug bounty donations. The program will be invite only for the time being, limited to a few dozen researchers. Apple plans to make it more open as it grows, and if a non-member discovers a significant bug, they'll be invited to the program. I discovered a bug in Apple's Mac update schedule. The Mac never seems to update. Can I collect $200,000? $200,000 is a great incentive to help detect these issues. Hopefully it's successful. The incredibly buggy new OS releases shows that Apple is no longer capable of doing it in-house - going the OUTSOURCING route. Not quite, doesn't matter how many gifted employees you have in-house you'll never catch everything. A familiar work environment breeds a familiar way of thinking, sometimes you need someone to take a look at code from a completely different perspective and it's amazing what can be spotted hiding in plain sight. Happens in all walks of life. Increasing the number of eyes on their systems with a financial incentive is a really efficient and effective way of catching security flaws. Can no longer do it in-house - going the OUTSOURCING route. Oh come on... Most other companies "outsource" it... Its smart business. Great idea. iOS will always be more secure than Android, and this will only further that gap. They can't even get stability right...maybe that power point will end up with "error...ppt slide reloaded." Apple is now outsourcing.....rewarding hackers to protect the company's reputation. Oh joy, somebody who doesn't understand how programming works or why bug bounties are out there. Shame Apple's own workers don't know how to fix bugs. You'd think they'd be paid to fix them. It sure is popular to hate on iOS developers these days without putting any real thought into it. Congrats. And if it means a more secure device, I don't know why anyone would be against it.